Actually LG-P990 provides built in email application where you can specify hotmail account but your account should be of domain @live.com only. You cant add other hotmail accounts! For example - @hotmail.co.uk, @hotmail.com, @msn.com, etc. To access mails from your hotmail account you will setup email settings manually. Open Email application on your Android phone open Menu and select New. This will show you list of supported accounts, select Other from the list. This will prompt from User name and password. Provide complete email id and password such as xyz@hotmail.com. Below are the steps forhow to Master Reset the LG Optimus P990 2X, to restore its original factory default settings. These steps will help you to master reset when you are able open the settings panel. 1. Open Settings panel from Home screen or from installed applications list. If your mobile is freezing or continuous rebooting or not responsive then you will have to try Hard Reset as mentioned below. 1. Turn off mobile and remove the battery out. Put the battery in. 2. Now Press and Hold the Power buttonand Volume Downbutton together. Hold till you see the Android icon. 3. Once you see the Android icon release the buttons. Now it will automatically start the master reset. 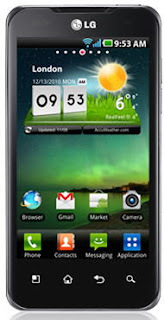 Once its complete just follow the on-screen procedures to reset the LG Optimus P990 2X.